Heavy Duty Street Name Sign Cross Piece Bracket 12"
Economy cross piece bracket can hold street name signs at a fixed 90o angle to one another. 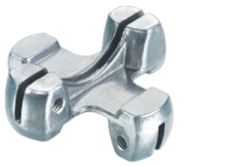 The cast aluminum construction is strong & durable. Bracket is available for flat street name sign blade types only. Hardware included to fasten street name signs to bracket. Set screws to mount both street name signs are included. For flat blade street name signs only. The Econo Cross Piece Bracket is recommended for 6" tall street name signs. 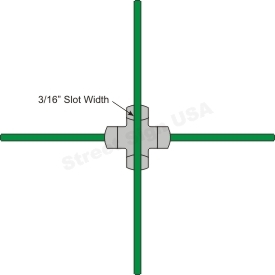 For 9" tall or extra long street name signs, we suggest using the Heavy Duty Cross Piece Bracket.